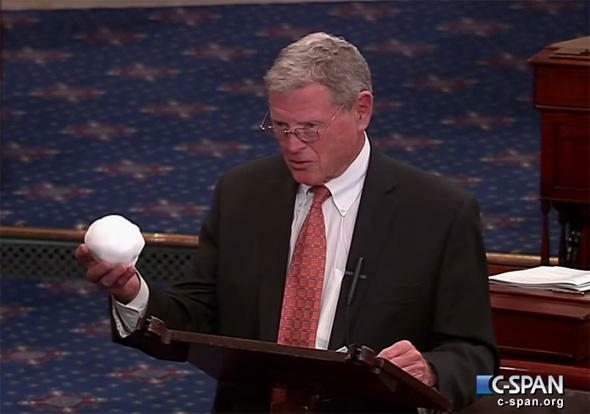 James Inhofe: Notorious climate change denier wants to crash Paris talks. Hot on the heels of finding out the chairman of the House Science Committee is amplifying his climate science denial to 11 comes the news that his counterpart in the Senate, James Inhofe, R-Oklahoma, has a dial that goes to 12. Inhofe, you see, may travel to Paris in December specifically so that he can disrupt progress at an international climate conference. Inhofe, you may remember (to your brain’s infinite regret) is the climate-change-denyingist of all climate change deniers. The apex (or nadir, really) of his career came in March when he—and it makes my synapses ache even to write this—brought a snowball on the floor of the Senate, claiming that it disproved global warming. This idea is ridiculous (the Earth’s axis is still tipped, folks, so we still have winter), but par for the course for the man who literally wrote the book on denying reality. He’ll do or say anything to downplay or reject anything to do with global warming. You may be shocked to learn that oil and gas companies donated nearly half a million dollars to his campaigns from 2011–2016. The Paris conference in question is part of the United Nations Framework Convention on Climate Change, an important group consisting of 195 countries that have signed on to reduce “ ‘dangerous’ human interference with the climate system.” President Obama is hoping to get a multicountry climate deal put into place at the Paris summit. My own expectations of this are low, since these summits haven’t had a huge success rate. But I think it’s better to try to have these meetings and be honest about the situation. Having Inhofe there won’t help, unless he’s planning on wearing a big red nose and shoes. I don’t know if I’ll repeat what I’ve done several times before, which is to go over and be the bad guy, the one-man truth squad, and tell the truth, that they’re going to be lied to by the Obama administration. What could possibly go wrong with someone like him at the summit? Except, of course, making the Unites States look even more foolish on a global stage. It’s too bad Inhofe doesn’t listen to some of his other party members in Congress, like Carlos Curbelo, R-Florida, who wants the GOP to focus more on climate change and work on incentives for alternative energy sources, and Kelly Ayotte, R-New Hampshire, who signed on with Obama and the EPA’s Clean Power Plan, which targets power plants to reduce carbon emission. I may quibble with both of these folks on specifics, but at least they’re facing the right way. Their heads are out of the sand, and that’s a breath of fresh air from the GOP on this issue. Tip o’ the snow cone to Allan Margolin.